I could end today’s Glory Seed now but it would not be right if I didn’t get my two cents in. Baseball/softball has been dubbed the great American pastime I’d like to add another one to the list (although for some it’s not a pastime it’s a way of life), making mountains out of molehills. There was a time when I was a decent baseball/softball player but two artificial hips, a troubled heart, and pulmonary fibrosis struck me out. While my baseball/softball career may be over I can still create mountains out of molehills with the best of them. It wasn’t that long ago whenever I’d hear Marty Robins singing, “But this time LORD you gave me a mountain, a mountain I may never climb,” I’d join him. 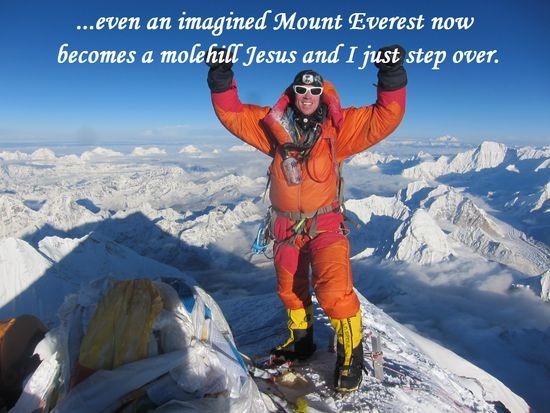 But when Jesus became a bigger Mountain in my life then even an imagined Mount Everest now becomes a molehill Jesus and I just step over. Know what I mean?